Duhamel, Baldé, Moscovitch: What’s Next? Retired skaters do not always completely close the door on the sport — or the competition they love most of all. A trio of former Canadian competitors enjoyed every minute of their new off-ice roles at the 2019 Canadian Championships in Saint John, New Brunswick in January. A year ago, Meagan Duhamel and Eric Radford were celebrating a seventh straight Canadian pairs victory. Their sights were firmly set on the 2018 Olympic Winter Games in PyeongChang, their competitive figure skating farewell. Bronze medalists in the pairs competition, they also went home with gold from the Team Event. Dylan Moscovitch had hoped to join his long-time compatriots in South Korea, but he and partner Lubov Ilyushechkina fell short of claiming one of the coveted spots on the Olympic team. Their partnership ended after a fourth-place finish at 2018 Four Continents, and Moscovitch called it a career. Elladj Baldé ended his career at the same two events as Moscovitch, but for him it was much more exhilarating. Baldé finished fourth at 2018 nationals with two of the most emotional and memorable performances of his skating career. After Four Continents, where he placed eighth, he moved on to the next chapter of his life. In Saint John, Duhamel, Moscovitch and Baldé were eager to reconnect with an event that will always hold a special place in their hearts. The three skaters spoke with IFS about what their roles were at nationals, what comes next in their lives, and the most memorable moments in each of their skating careers. What was your role at this year’s nationals? Baldé: I’ve been doing backstage interviews. I do all the Facebook lives – anything to do with digital content. Instagram, Snapchat, all those things. I’ve also started to do some commentating. Ted (Barton) asked if I would like to do some commentating (for an online stream of the event), and I decided to give it a try. I actually love it, and I got to do it in French. People are not listening to that as much as the English (stream), so I got to practice and make mistakes. Myriane (Samson) is good at guiding me through it because she is so good at what she is doing. She was very helpful, and it was nice to have her as my teammate. It’s new and I’ll be back next year doing the same thing, which I’m super excited about. I also am skating in the gala here and choreographing the finale number. Duhamel: I was coming just to be a spectator, originally — my husband (Bruno Marcotte) is coaching many pair teams, and I just wanted to come. I love Canadians, I just wanted to be here and be part of it in some way. I reached out to Skate Canada and asked for a pass and volunteered myself to do any work they might see fit. I had worked at the Grand Prix Final (in Vancouver) with Ted Barton doing some commentary on the live stream of the junior events and interviewing skaters. They asked me to do that again here, so I’ve been doing interviews in the kiss and cry and doing the commentary for the live stream of the junior and novice events, and the early groups in the senior. I really like doing that. I love skating, I love to talk, and I love to analyze things, so I don’t know what job would be better for me than doing that. I like chatting with the skaters in interviews more than I thought I would. It’s interesting to talk to them and hear their stories, especially some of those juniors who don’t really get much chance to tell their stories. Moscovitch: I’ve been working doing live streaming work for Skate Canada, interviewing athletes in the kiss and cry after they compete, and doing some commentary for the live stream with Ted Barton. Also capturing some footage backstage, some extra B-roll stuff for the feed and just being around skating again. What was it like to be at a Canadian Championships as a spectator and not a competitor? Baldé: It’s great. As seniors, we get in later in the week and then we practice and compete, so we don’t get to see the juniors and novices, the younger generation. So, for me, this is the first time that I got to watch the novice and junior skaters, and since I was commentating, I literally saw everyone. It was really interesting because there’s so much potential in Canada. It’s really nice to see the future we have here. When I was watching the senior men, I did have a bit of a feeling of ‘it could be fun to be out there,’ but I’m not in a place where I want to come back to competition. Duhamel: It feels unusually natural. I don’t feel any urge that I should have been skating, which is strange. All season, I’ve been going to events and I don’t have any urge to be competing. I do miss training, like the grind of training. But that nervous pressure I would feel in competition — you feel it all week long and you feel like you are on the verge of having a heart attack at almost every moment — I’m over that feeling, and I don’t want to feel that anymore. Now I watch other skaters on warmup, and I have a little giggle to myself, imagining what they are feeling. And I don’t have to feel that anymore! Moscovitch: It’s interesting. It’s a mix of emotions but for the most part, it’s been fine. I’ve made peace with my exit from the sport. Even though it didn’t end the way I wanted it to, I was ready for it to end in that time frame. Being back here … this is the most skating I’ve watched in one sitting in like a decade. I’ve been here all day, every day, from the novices right through the seniors. It’s interesting seeing the development and the next wave in our country and being removed from it. At times, I feel like I want to get out there, but for the most part, I don’t. I feel happy watching other people go through that. What are you doing in your post-competitive life? Baldé: I’m busier than I’ve ever been. I’m constantly on tour. Even before I was retired, I was touring, and it hasn’t stopped in the last year. I’m lucky enough to be busy in this world because I still get to skate. I still get to do triple Axels and triple-triples and stuff like that. It’s fun for me to still be able to do all these things, but in a different setting now. Duhamel: Eric and I were on tour this fall for two months, and we spent all of December doing shows. We did a Christmas show in New York and another one in Dallas. We went to Italy after Christmas. We’ve also been doing some seminars. Last week, we were in my hometown (Lively, Ontario), and next week we’re going to Fort Frances, which is in the middle of nowhere in Northern Ontario. I have a seminar in February in Kapuskasing with my husband, and then we start shows again in March. Some club shows, then Stars On Ice in Japan and Canada. So, it doesn’t really stop, and it hasn’t really stopped since the Olympics. Moscovitch: No shows for me as of now. I am coaching figure skating as a consultant, working for Skate Ontario. I’m helping to develop and deliver development seminars for pairs and trying to help the country put together more teams and more partnerships that have potential success. I like staying involved with the sport, but not having the responsibility of someone’s career in my hands because I have too many other interests right now. Baldé: I’m going to do shows for the next few years, but I’ve started a company called Skate Global and, as of right now, we do seminars in Canada and in Europe. We’ve customized a seminar that not only focuses on technical stuff, but also on artistry — everything that’s a part of interpretation of music, musicality, improv classes, stuff like that. Things that will help skaters develop their artistry and their uniqueness. At the end of June I’ll be hosting a seminar in Montréal and anyone can come. 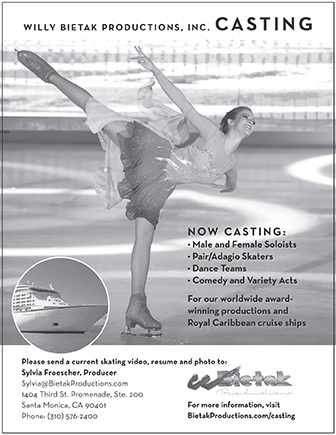 I’ve teamed up with Patrick Chan, Kaetlyn Osmond, Liam Firus, dance teachers and off-ice dancers. It’s a team of professionals who want to give back to the sport. I’m super excited about it because this is what I want to do long term. I want to have this become a travelling seminar. I did a camp in Spain last summer and I’m going back again this summer. I want to expand in Europe and in South America. These are my goals in terms of a long-term project. Duhamel: I have a mixed bag of things I want to do, so I need to find a way to narrow it down. I’ve got my two degrees in nutrition, and I definitely want to help skaters in the wellness part of sport. I really dream about opening a yoga studio with a vegan café in it, and doing little nutrition classes and cooking classes at the café. That’s really one of my biggest dreams. I coach a little bit. I really enjoy coaching, and I really enjoy doing commentary stuff. Really, anything involved with skating. I started my training to be a technical specialist. I did Phase 1, but I haven’t finished it yet. I want to have babies — I want to have a family. So, there are so many things I want to do, and I don’t even know what order they’re going to get done in. After Stars On Ice is done in the spring, I’m going to have to reassess things, and my husband and I are going to have to reassess where we’re at and which step comes next. Moscovitch: I have a few. Right now, I’m pursuing acting and film and TV. I’m new to it, but I really, really enjoy it. There are a lot of parallels coming from figure skating, and also just being an athlete — the way you approach it, and also the long-term investment of your time and effort. I very much enjoy the storytelling aspect of the business, and I have started to write some of my own ideas. I’m learning how to write screenplays. I’d like to write and produce and learn to be involved in all aspects of telling a story. I also enjoy the broadcast side of skating as well. I’ve done a bit of work for CBC and now Skate Canada, and I’d like to continue to grow that career. I’m coaching hockey and power skating quite a bit in the Toronto area. I’ve been getting a lot more traffic, I guess you could say, and I’m looking to build and develop that as a business for myself. What is your favourite memory from your competitive years? Baldé: Last year’s nationals were by far the most magical moment of my career. I was coming off an injury (a concussion), I went three months not skating and only had a month to prepare for that competition. It took everything inside of me to go and believe in myself. I was able to stay open and be vulnerable in front of the crowd and kind of tell my story in 2½ minutes and then 4½ minutes. It was a special moment and definitely the most fulfilling moment of my career. That’s why I was able to leave the sport feeling so good. I don’t have anything else I want to accomplish. I performed the best performances of my life. I’m happy. Duhamel: Winning the first national title in Moncton in 2012. That’s still the highlight. It has to be. That was when our lives changed. It was the start of everything that we didn’t even think was possible. You kind of give up that hope of winning a national title, after so many years of not doing it and so many years of struggles. But when it finally happened, it was magical and life-changing and I never imagined it happening again and again like it did. Winning an Olympic medal, winning two World titles … those were amazing moments and amazing skates, but nothing was quite as touching and as soulful as winning that first national title in Moncton. That was just the most unbelievable feeling for both of us. Part of it was being in the right place at the right time, and then repeating that. It was also a lot of hard work, and a lot of coming to nationals in pressure situations. We never once had an easy ride to a national title. Every one of them was special in their own way. I still remember that day in Moncton so clearly, and it was seven years ago. I remember walking backstage and thinking ‘this is your opportunity; this is your moment. If you don’t seize it, you’ll never have something like this again.’ I still remember telling myself that and I knew how important that moment was, and I knew that would be a moment that would change our lives if we seized it. Because of that, we went to Worlds as Canadian champions and we finished fifth. There were all these things that followed after that, but none of them would have happened without that first national title. Moscovitch: The people. It’s always the people. If we’re talking on the ice, Worlds in London, Ontario (in 2013) was one of my favorites. Home crowd, and Kirsten (Moore-Towers) and I had two of the best skates we ever had. That was one of the most memorable. And of course, the Olympics (in 2014) — the Team Event, standing side by side with some of my childhood friends and Eric (Radford). We always competed against each other and we finally got to compete together as a team. But it’s the people, the friendships I forged, the memories I shared with them, and the family that I’ve developed in my 30-odd years in this sport that I’ll remember the most.